You can clone any lead campaign in PX. This is a useful option when you have an already configured campaign and wish to start one more with similar settings. The cloning option helps you save your time and efforts and create a new campaign for 15 minutes. 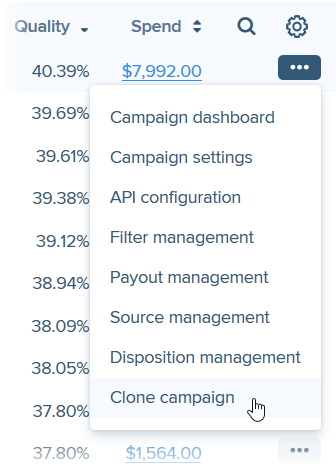 You can clone API configuration, leg mappings, filters, payout rules, and source management settings of any existing lead campaign. To clone a campaign, go to Campaigns, find in a list a lead campaign which you wish to clone -> click its Action -> Clone Campaign. 1. Target Campaign - select the campaign that you wish to clone. If you don't make any choice, you will clone the campaign which you previously selected. 2. New Campaign Name - enter the name for a new campaign (by default, new is added to an old campaign’s name). It is recommended to combine Buyer Name and Vertical (e.g. Buyer Name Auto) in order to keep data organized and simplify the support process. Avoid special characters. Live API configuration - all settings for new campaign-clone will go in Live mode, but API configuration won't be available for editing. Test API configuration - API configuration for a new campaign-clone will be available for editing. 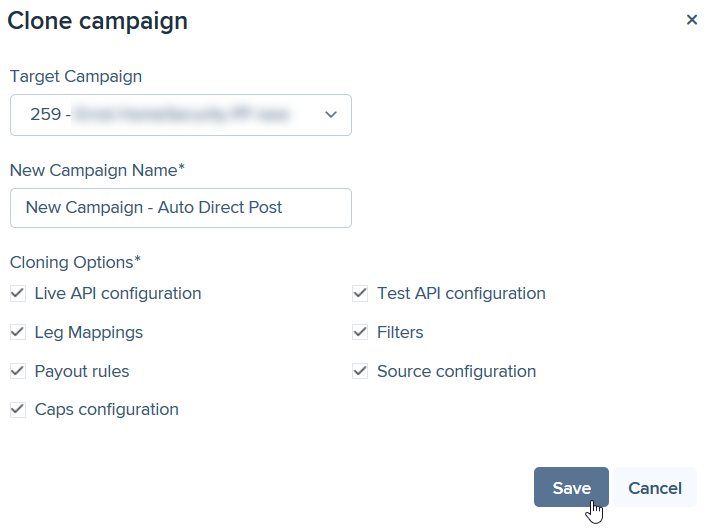 It is recommended to select Test API configuration checkbox, so that you can check that all API settings for a new campaign before going Live. Select Leg Mappings, Payout rules, Caps configuration, Filters, Source configuration checkboxes to copy these settings to a new campaign. However, if you wish to set other filters and sources for a new campaign in order to distribute traffic differently, leave corresponding checkboxes blank. Click Save to save a campaign-clone. You will be redirected to a new page to setup API for a new campaign. All settings are copied from the cloned campaign. Make changes if you need, following API Builder Guide. As soon as you a ready with all 5 steps, click Go live -> Yes in the dialog box. go to Campaigns, find the recently created campaign-clone in the list. Navigate to Status column and select All sources or Selective sources, according to your preferences. go Source Management and find the recently created campaign-clone in the list. Select All sources or Selective sources in campaign mode drop-down list, according to your preferences.